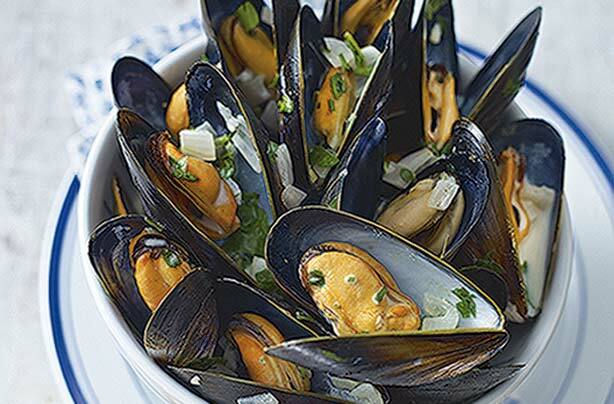 A classic way to serve mussels, this recipe for Moules Marinière comes with a delicious white wine and garlic sauce, make sure you have plenty of bread to mop it up! Rinse the mussels well to remove any grit. Melt the butter in a large pan and add the garlic and shallots. Cook them for a few mins over a low heat to soften. Pour the wine into the pan and bring to the boil, then add the mussels. Cover the pan and cook over a med heat for 3-4 mins, shaking the pan occasionally, but without removing the lid so that the mussels steam in the pan. Remove the lid and check that the mussels have opened, then stir in the cream, black pepper and most of the parsley and heat through. Ladle into bowls, sprinkle over the remaining parsley and serve with crusty bread.